Ready Retrospective is a collection of reinterpreted works taken from Gratrix’ exhibition portfolio to date- an indirect retrospective of objects. Gratrix makes sculptural installations inspired by spaces and place he has both lived in and visited. Responding to time, aesthetics and a constant change of curiosity towards the artists circumstances. Elements within the installation include a suitcase referencing the ongoing project “Have Art Can Travel”- exhibiting art made to fit inside reclaimed suitcases. 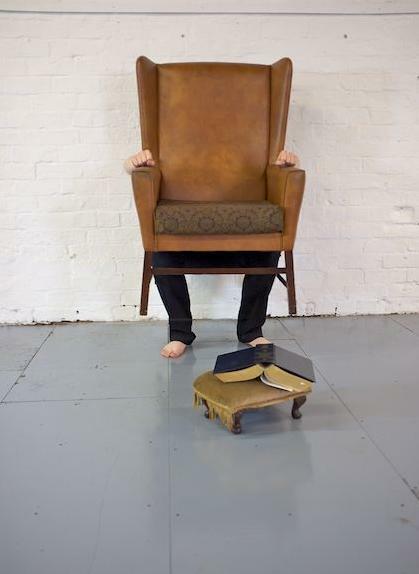 A seat referencing both video performance pieces interacting with ‘the object’ and photography collaborations using chairs. A collection of reclaimed skirting board taken from household spaces as part of his 2011 solo show “I am gARTh” and a stack of Lampshades, referencing his first ever solo show in 2008, which housed a 30ft Tower of shades on a side table. The space in which these sit is the ‘new’ sculpture, built to accommodate the past as it rests in the artist’s home town ofBlackpool. Ready Retrospective is a reality that is staged, performed, but truthful. Garth Gratrix will be exhibiting his work alongside local artists John Marc Allen, Micheal Cassidy and the Langdale Centre Photography Group from Friday 13th April at Bar Red, St Johns Square, Church Street, Blackpool. There will be a launch event at FYCreatives, Church Street from 6-8pm on Friday 13th April, with a tour of the windows at 6.30pm.